In the fall of 2011, I was asked to play the low reed chair on the first national tour of the Tony Award winning Broadway show, Memphis. Since I didn’t own my own bass clarinet at the time, and had been borrowing horns to this point, this posed a problem. As a sub on Broadway, I had the good fortune to use my friend’s Selmer bass clarinet from the early to mid 70’s ­ one of the “holy grail” of bass clarinets ­ and a wonderful, free­blowing instrument with a large and very warm sound. I was also fortunate to be able to borrow and play a new wooden Buffet Prestige low C -­ again a spectacular instrument. I am a doubler, saxophone being my primary instrument. 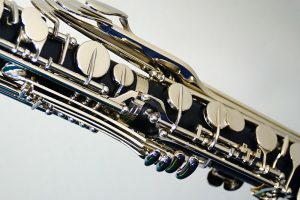 The idea of spending almost $10,000 on a new Buffet or $7000 on a good used Selmer, and for an instrument that I would consider an occasional double, was just not something I was interested in doing, nor financially prepared to undertake. Add to that fact the reality of traveling a very expensive, and rather fragile piece of wood around the country, from climate to climate on trucks and being handled by road crews that, to be generous really don’t have much patience for or care of transporting your instruments, you have a recipe for heartburn and heartache on a daily basis. After much reading, research, anecdotal evidence and speaking to other players about their experiences, I decided to give the Ridenour Lyrique low C bass a try. Based on the information I could find, it seemed to be a reasonable combination of quality, playability and price. In short, a good value for the money. I ordered the instrument, and as they were backordered, waited a few weeks for the instrument to arrive. I honestly didn’t know what to expect from the instrument. Of course I had hoped for it to be a “great” instrument ­ whatever that means in anyone’s personal, non­objective experience. I have always been somewhat leery of Chinese manufactured instruments, as while I have played (and do own) some very fine instruments manufactured there, I have also played many that were absolutely horrible, and virtually unplayable. My fears as regards the bass fortunately were completely unfounded! The instrument arrived, packed extremely well, and had obviously been regulated and set up before I received it. On opening it, the first impression I had was of the instrument’s case itself. Very well made, solidly built and sturdy. I immediately pulled it out of the case, greased up the cork joints and put the horn together. Everything was beautifully engineered and fit with no issues. It’s a very well crafted and lovely instrument. The instrument body is made of a composite hard rubber, which for an instrument that will be travelled extensively is a wonderful thing. No worries about cracks, splits or the usual natural expansion and contraction of wood, dependent upon temperature and humidity. It was always great to know that the horn would fit and play with consistency every time I opened the case. The keywork is solidly built. One of the biggest concerns I had was whether or not the long­throw keys for the left hand low notes would be strong enough to not bend or warp from continued use. The keywork is solid and firm but with enough flex to feel comfortable under the fingers. One minor complaint I have is that the positioning of these keys under the left pinkie finger is a little awkward for my hand. (I have relatively small hands). The right hand thumb keywork is a bit awkward as well and a little soft in action ­ as the throw is longer to make levering those long keys easier, though with practice, it becomes less of an issue. The double register key makes the horn very responsive and even throughout the registers and across register changes. This clarinet blows rather freely. Not as freely as some old Selmers I have played and certainly not as freely as my saxophones (it is after all, a clarinet!) but overall I found it to be a great compliment to my other horns as a doubling instrument and switching between horns, to and from the bass, to be quite comfortable. Probably the most impressive aspect of this clarinet is the sound. The sound is rich, resonant and warm, and is extremely consistent across the range of the horn. I was very pleasantly surprised at the “woodiness”, and by how warm and round it is with a wonderful depth of tonal color. Lots of projection and power without sacrificing tonal depth or expressiveness. I have found the scale to be uniform and the overall pitch of the bass consistent with no real problem areas or individual notes. I travelled the bass inside its original case, placed inside an Anvil style road case custom fit for the factory case. “Case­in­a­case” style. This was loaded and unloaded by road crews dozens of times, in hot to freezing cold climates and travelled thousands of miles on trucks without climate control. I had absolutely ZERO issues with regulation, sealing, corks, keywork, pads etc. The bass always came out of the case in wonderful shape, and ready to play. This thing is DURABLE! And it travels great. Finally, after sitting stored in my studio for over 15 months, I recently had occasion to use the bass again for a recording project. I literally hadn’t cracked the case in well over a year and was quite curious to see how it had fared stored all this time without being played. In a word, wonderfully. It came out of the case, ready to play just as it had been when I last packed it away! I was quite pleasantly surprised at this. And oh yeah, this thing records great! If you are a doubler in need of a well playing, good sounding, durable and reliable bass clarinet, you would be hard pressed to find a better low C bass than this one. You certainly won’t find one better in this price range. I know. I looked.